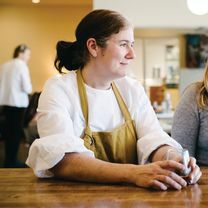 Gretchen Hovey is the Co-owner and Pastry Chef for Hovey & Harrison in Vail, CO. Their concept is a cafe that offers monthly meal subcriptions. "It’s always a great day for some fresh made @blainestomatoes !!! Everything found in our market right now! Love summer 🍅🍅🍅 • #seeyouathandh"
"Thank you for yet another amazing dinner, @#food"